This anthology of horror comics written by women and edited by Lindsay Moore gives the genre an interesting new perspective with unsettling tales that don’t rely on blood soaked machismo to scare you senseless. Dark Lady – published in October, 2015, Dark Lady is Hellcat Press’s first anthology. It contains ten short scary stories written and illustrated by women from around the world. 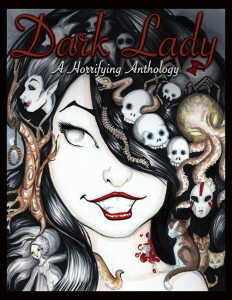 Dark Lady is an all-female anthology, meaning that all stories and art were produced entirely by women. If you would like to purchase a copy of Dark Lady, visit our store. Simply Sinful – published in September, 2016, Simply Sinful is an anthology all about the Seven Deadly Sins. It contains fourteen short scary stories written and illustrated by men and women from around the world. 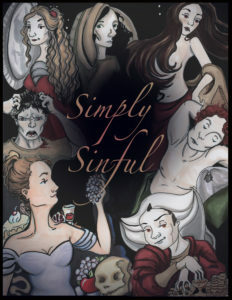 If you would like to purchase a copy of Simply Sinful, visit our store. 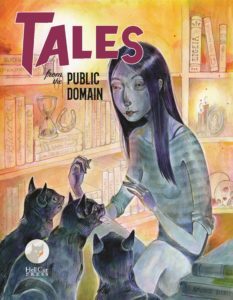 Tales From the Public Domain – published in August, 2017, Tales From the Public Domain asked writers and artists to take their favorite public domain horror story and breathe demonic new life into it. It contains sixteen short scary stories based on the works of Edgar Allan Poe, H.P. Lovecraft, Charlotte Perkins Gilman, Kate Chopin, Mary Shelley, Ambrose Bierce, Algernon Blackwood, and others. It features writers and artists from around the world. If you would like to purchase a copy of Tales From the Public Domain, visit our store. 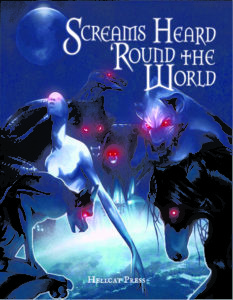 Screams Heard ‘Round the World – published in September 2018, Screams Heard ‘Round the World asked writers and artists to take a myth, legend, or monster from a foreign country and craft a spine-tingling tale around it. Hellcat Press’s most ambitious anthology to date, Screams Heard ‘Round the World is 230 pages of pure international terror. If you would like to purchase a copy of Screams Heard ‘Round the World, visit our store.